Nanoarchitectonics in Biomedicine describes this new area of nanoscience that has emerged as a major branch of nanoscience. The book brings together recent applications and discusses the advantages and disadvantages of each process, offering international perspectives on the technologies based on these findings. It offers new insights for nanoarchitectonics, starting with the currently used methods of synthesis and characterization of such materials, along with their biomedical applications. 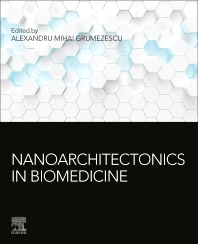 Authored by a wide range of international scientists, this volume shows how nanoarchitectonics is being used to create more efficient medical treatment solutions. Users will find this to be an important research resource for those wanting to learn more on the emerging topic of nanoarchitectonics in biomedical science. 15. Solid Lipid Nanoparticles(SLN): Fabriaction methods,Charecterization Techniques and　in vitro--in vivo study.